On August 24, 1981, Mark David Chapman was sentenced to 20-years-to-life in prison for the murder of John Lennon. Chapman shot the legendary musician four times outside his New York City home, the Dakota, on December 8, 1980. 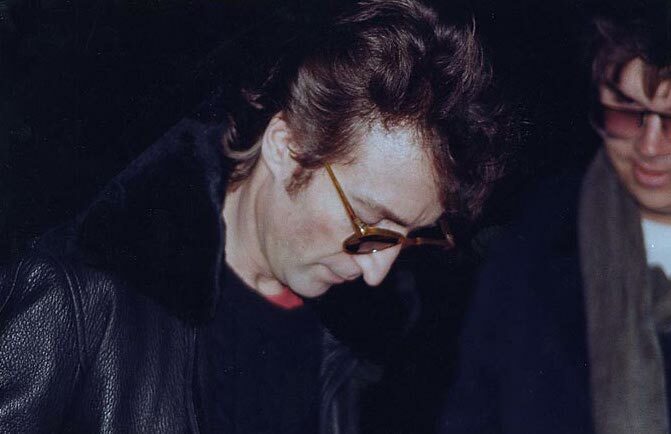 As Lennon exited his car and walked towards his apartment building, four of the five .38 caliber hollow point bullets fired by Chapman ripped through Lennon’s back and the world lost one of the most influential voices of the late 20th century. Chapman, who was 25-years-old at the time, was charged with second-degree murder. (In New York, first-degree murder charges were reserved for cop killers.) After his arrest, he underwent extensive psychiatric evaluations. The consensus was that while Chapman was delusional, he was also found competent to stand trial. This was a serious blow to Chapman’s defense lawyer, Jonathan Marks, who was counting on his client being found not guilty by reason of insanity. His hopes were further dashed when Chapman decided to plead guilty to the murder charge on June 22, telling Judge Dennis Edwards that God had told him to do so. He said he would never change his plea or appeal his sentence no matter what the outcome. Marks strenuously objected. He stated he had “serious questions” about Chapman’s competence to make that decision, and requested further assessments be done on Chapman’s mental state. Judge Edwards declined all of the defense’s requests, declared that the defendant had made his plea of his own free will and deemed him competent to do so. The sentencing hearing took place on August 24, 1981. Two psychiatrists were called to testify on Chapman’s behalf. Judge Edwards interrupted the second doctor’s spiel and reminded him that the issue of the defendant’s sanity has already been settled, so there was no question of Chapman’s criminal responsibility in Lennon’s murder. This drew applause from those present in the courtroom. The District Attorney claimed Chapman murdered the world-renowned, much-loved Beatle in a tragically pathetic attempt to share in Lennon’s fame. Years later, Chapman himself would cop to this as being his only motive for killing John Lennon. He’s probably the best modern example of an individual seeking herostratic fame – someone who commits a crime to achieve notoriety. Mark David Chapman was sentenced to 20-years-to-life for his crime. He was also ordered to receive psychiatric counseling during his incarceration. Every time Chapman has gone up for a parole hearing, he has been denied. In 2004, Yoko Ono wrote the parole board stating that she felt Chapman still posed a danger to her family. She has also stated that she thinks Chapman himself would be in great danger if he is released, with many Lennon fans having threatened to kill him over the years.